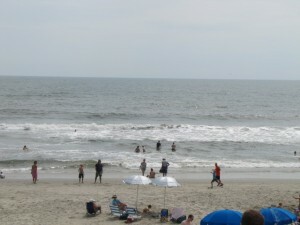 The Outer Banks of North Carolina, the barrier islands that run along Rt 12 on the coast of North Carolina, are home to a number of beach towns and a popular vacation destination. 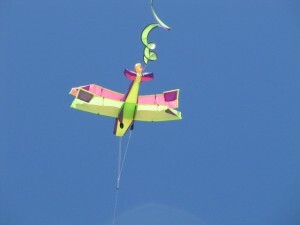 Although the beaches are beautiful, there are many other things to do and explore while you are there. There are of course, many restaurants and shops, as well as activities, such as mini golf and climbing structures, but there are also a number of historic sites to explore. The Fort Raleigh National Historic Site is the location of the first English settlement in America, which tragically ended in mystery. All 117 people in the colony vanished without a trace. At a ranger-led talk at our visit, we explored the possibilities and most popular theories. A live performance, The Lost Colony is held during the summer months by the non-profit Roanoke Island Historical Association. The nearby Roanoke Island Festival Park, a North Carolina Historic Site offers a peek into history as costumed interpreters demonstrate life in the 1585 settlement or onboard the Elizabeth II, which represents one of the seven ships bringing colonists to America in 1585. The Wright Brothers National Memorial at Kill Devil Hills celebrates the birthplace of aviation. While there, one can visit the Flight Line where history took place, peek into 1903 camp buildings and explore the Visitor’s Center. As is common with coastal land, nature has shifted the coast and created and moved dunes and inlets. Numerous hurricanes have changed the structure of the Outer Banks, which have effectively served as a protector to mainland North Carolina. Between Corolla and Cape Hatteras. there are 5 lighthouses. 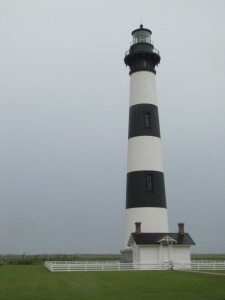 Just south of Nags Head, the Bodie Island Lighthouse (pronounced “body”) stands 150 feet tall and is open to climb subject to weather conditions. On the day of our visit, thunderstorms threatened so admission was limited to the ground floor. 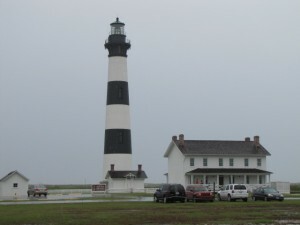 The other lighthouses are the Currituck Lighthouse in Corolla, the Okracoke Lighthouse (which is the nation’s oldest operating), the Cape Hatteras Lighthouse (the tallest brick lighthouse in the country), and the Roanoke Marshes Lighthouse. The Graveyard of the Atlantic Museum in Hatteras delves into maritime history. The coast of North Carolina is known for its density of shipwrecks, which is one of the highest in the world. 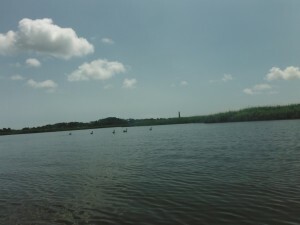 The waters are known for their tales of pirates and Civil War battles, as well as engaging with submarines during the World Wars. 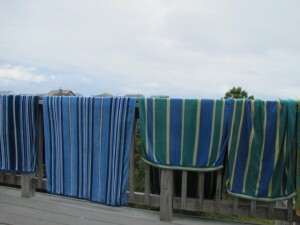 We only had a week on the Outer Banks, so we still have much to see. I look forward to future visits and to further exploring the historic sites. On the northern end of North Carolina’s Outer Banks, Corolla is a popular vacation destination and the one-time home of North Carolina’s state horse, the Colonial Spanish Mustang, (for their safety have been moved north of Corolla in the area beyond the paved road which is only accessible by 4-wheel drive vehicles). The town has a long history. 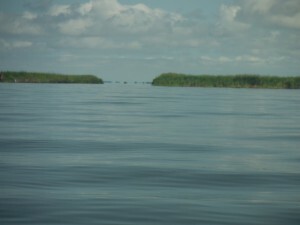 As is common with coastal land, the terrain has shifted over centuries. 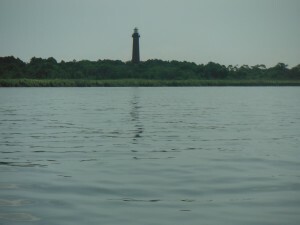 Up until early 1800s, it was only accessible by boat and its residents got by through hunting and fishing as well as salvaging items from shipwrecks. Other towns came and went, but the residents of Corolla stuck it out. Government jobs in the 1800s increased the population. 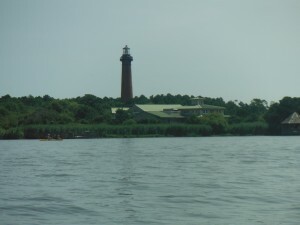 Between 1873-75, the Currituck Beach Lighthouse and the Jones’ Hill Life Saving Station were created. In 1895, Jones’ Hill (as the area was then known) had grown enough to get own Post Office. The US Postal Service asked for suggested for a name. Corolla (which is the inner part of a flower) was suggested and ultimately chosen by the postal service. In 1905 a one-room school was established. 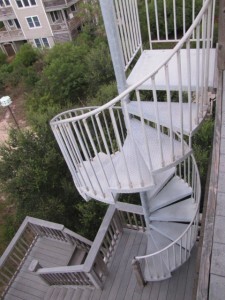 Some of these 19th century structures remain in what is now known as Corolla Village, a collection of charming buildings surrounding the 162-foot tall lighthouse, including the Corolla Wild Horse Museum and charming shops. In 1922 the Knights of Newport, RI began building their 21,000 square foot winter home, Corolla Island, which was completed in 1925. In 1940, under new ownership, Corolla Island was renamed the Whalehead Club, and was leased to the Coast Guard during WWII. The Club was used as a boy’s school in the summers in the 1950s. Today, the building has been restored to its appearance in 1925 and is listed on the National Register of Historic Places. 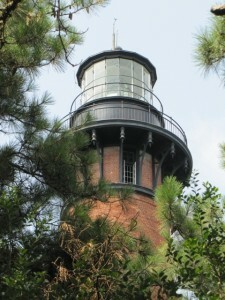 Owned by the county, it and the lighthouse are both part of the Currituck Heritage Park. Whalehead offers seasonal tours of the building and hosts special events throughout the year. In the 1970s, only about 15 people lived in Corolla. The road to town was an unpaved trail along the sound, which the state later took over the road, and it became part of NC 12 in 1984. More than 1500 homes were built over the next ten years. Over 500 more were added over the next five years, most of which are vacation homes, more than half are 5000 square feet or more. 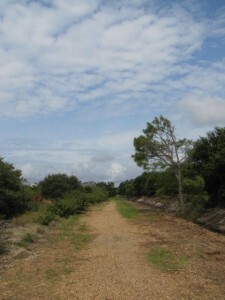 This road continues through most of Corolla, but simply ends at an expanse of sand. There are homes (and the horses) beyond this point, but they are not accessible without the use of a 4×4 vehicle. 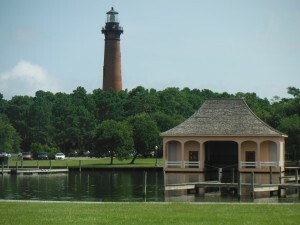 Today the town of Corolla is relatively quiet and family centered. The houses are packed close together and are a variety of sizes and styles. Two summers ago, we spent a week there at a rental with extended family. The house we rented was a short walk from the beach and boasted a “bird’s nest” rooftop sitting area which was among the tallest in the area, where we could view both sunrises and sunsets. 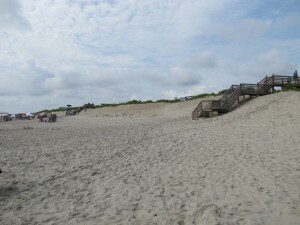 Wooden walkways protect the dunes and help reduce erosion. 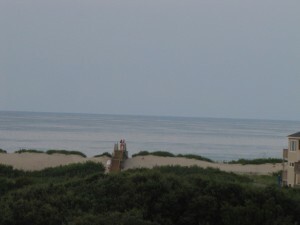 Dunes have been created to protect the town. A reservoir in our neighborhood was home to a few turtles, and the kids were entertained simply watching them. 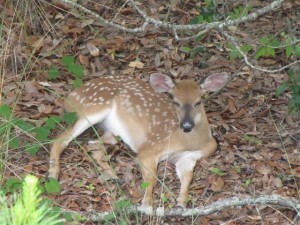 We also saw a few deer, including a fawn napping in our backyard. 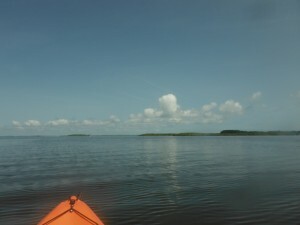 We happen to own ocean kayaks and had brought them along with us (rentals are also available). We spent a lazy afternoon exploring the sound and my husband and son tried them out in the ocean. We also spent time lounging on the beach, playing in the ocean and the sand and searching for seashells. My niece was fascinated by the exoskeleton of a horseshoe crab that she discovered. There are a number of restaurants in Corolla, but for the most part, we chose to eat in. We did pick up pizza from Tomato Patch Pizzeria our first night there, which was very good. Instead, we went to the Food Lion and Seaside Farm Market and prepared food back at the house. 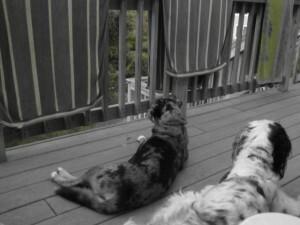 The area is dog friendly and our pups also enjoyed the vacation. Shopping included the traditional beachy souvenir shops, upscale gift boutiques and antique markets as well as outfitters for water sports. 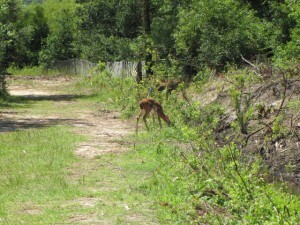 An 18-link golf course, mini golf, go carts and a movie theater are right in town, and tours via 4×4 vehicles are popular and are probably the best way to see Corolla’s horses. 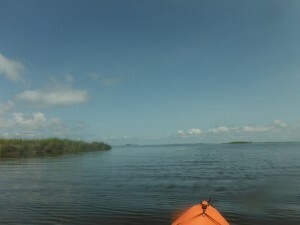 Fishing, surfing, kayaking and stand up paddle boarding rentals and lessons can be found for those who would rather be in the water. 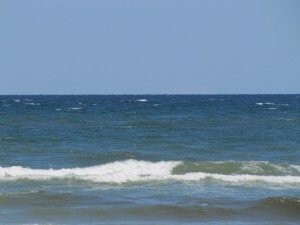 The Outer Banks have much more to offer, outside of Corolla, but we spent most of our week locally. The ride in on a Saturday morning (which is when most of the rental periods start) had us almost at a standstill for a couple hours, causing some to not want to venture out until the week’s end. Having a fondness for lighthouses, I couldn’t pass up the chance to visit another one nearby, so I did make a trip out, but will include that in a separate post. 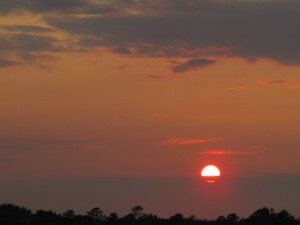 I enjoyed our week in Corolla, and hope to go back, hopefully with a 4-wheel drive to explore the area further.